Disney has always believed in maximizing the value of its properties, or, as some cynics might say, wringing every last possible cent out of them. But now, with the prospect of having to come up with enough content to challenge Netflix as a streaming service, they are doubling down on their recent trend of remaking classic animated films. Later this year, we will get the chance to see Will Smith play the genie in Aladdin and computer-generated lions play the traditionally animated lions in The Lion King. But for now, we get Dumbo, an odd cross between the all-animal world of The Lion King and the special-effects-laden human world of Aladdin. 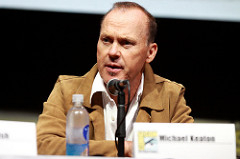 As remakes go, the new Dumbo isn’t bad, except for two big stumbling blocks, Michael Keaton and Dumbo himself. The original 1941 Disney animated version of Dumbo ran just over an hour, and the current movie at first covers the same basic ground as the animated film did, with some updating to replace the changing times. Gone are the racially insensitive crows and very sensitive mouse who helped Dumbo fly and the stork that delivered Dumbo. Instead, Dumbo is the offspring of Mrs. Jumbo, whom conniving bur warmhearted circus owner, Max Medici (Danny DeVito) buys while pregnant. The year is 1919, the circus is struggling, and Max figures he’s getting two elephants for the price of one. But, when Max sees Dumbo’s huge ears, which make the dwindling number of attendees at the circus ridicule the young elephant, he realizes he has a potential disaster on his hands. In desperation, Max turns to his former star trick rider, Holt Farrier (Colin Farrell), for help. Holt lost an arm in World War I and a wife to the flu and is now trying to find a new position in the circus and raise his two children, Milly (Nico Parker) and Joe (Finley Hobbins). Like the Farrier children, Dumbo is soon without his mother as well, when she nearly causes a riot during a performance trying to come to the aid of Dumbo. Max is forced to sell her off at a loss, and Holt and his children are now Dumbo’s full-time guardians. While working with Dumbo, Millie and Joe discover that the elephant really can fly when they use a feather to get the creature’s attention. They don’t tell anyone else at the circus, but when Dumbo gets trapped on a high aerial platform during a clown act, Milly coaxes him into flying again, delighting the audience. With a flying elephant in the ensemble, Max’s circus becomes a big hit and attracts the attention of showman and entrepreneur V. E. Vandevere (Michael Keaton). The showman envisions Dumbo being ridden (or, more accurately, flown) by his star aerialist, Colette Marchant (Eva Green) under the enormous big top that is the centerpiece of Dreamland, Vandevere’s amusement park of the future. To get Dumbo, Vandevere becomes a partner in Max’s circus, promising to take care of all of Max’s circus workers. Vandevere is a cross between P.T. Barnum and Mr. Potter in It’s a Wonderful Life, and Michael Keaton plays the role as a cross between his Ray Kroc in The Founder and J. Montgomery Burns from The Simpsons. Moviegoers who remember the original Dumbo are probably well aware that there was no Vandevere character in the Disney animated film, nor, for that matter, was there a Dreamland or anything else that occurs in the last hour of this remake. Dreamland, Vandevere and pretty much everything else that is seen on screen in this two-hour remake’s second half are not products of 1919, or of 1941 when the animated film was made, but, rather, of the 2019 Disney mindset as filtered through a script by Ehren Kruger. To justify remaking Dumbo, the powers-that-be at Disney apparently felt that the movie needed to be “big.” And this last hour is certainly big, although, at some point, bloated becomes a more fitting description. Keaton goes all in on his role, lacking only a mustache to twirl in his portrayal of corporate greed. Truth be told, the entire Dreamland concept works for a while, with its “World of Tomorrow” and other attractions playing like prototypes for a Disney World to come. But, at some point around the time that Vandevere puts in an appearance in the control tower of his domain, Dumbo ceases to be a goofy, fun riff on corporate excess (surprising, because Disney allowed its image to be villainized and lampooned). Instead, Dumbo turns into just another action spectacular, with the flying elephant zipping around willy nilly, leading me to wonder if he would encounter one of the flying dragons from Game of Thrones. The other main problem I had with Dumbo was with the computer rendering of the creature. In 1941, Dumbo didn’t really have to actually appear to be flying, just like Pinocchio’s nose growing didn’t need to be lifelike. That movie was an animated cartoon, after all. But, in 2019, if you’re going to create a circus with live circus performers, some live animals, and what at first appears to be an authentic backdrop, then the elephant should really look like a flying elephant. 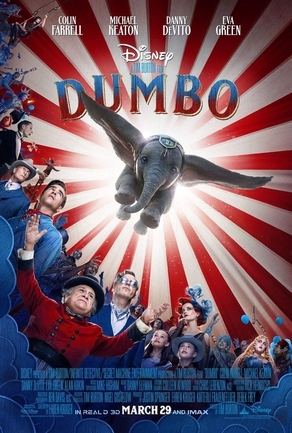 Instead, Dumbo looks like a giant version of the floppy-eared stuffed animal that will doubtless be sold at Disney concession stands everywhere (there’s an eerie similarity to an Eeyore stuffed toy). This Dumbo is undoubtedly cute and rather funny at times, but the necessary emotional connection between actors and CGI creation just isn’t there. While young Mowgli definitely seemed to be cavorting with bears and panthers in Disney’s live version of The Jungle Book, here, the Farriers never do. Certainly, the CGI technology exists that can make a realistic flying elephant, but Burton and his army of effects people can’t find the right touch. The movie has some funny elephant shtick, but it never rises to the next level. Tim Burton is able to make up for the lack of pachyderm emotion in Dumbo with some nice performances by his human cast and with the overall circus atmosphere he creates. Danny DeVito plays another one of his lovable rascals, and the always enjoyable Alan Arkin shows up for an extended cameo late in the movie. Also, Eva Green, who usually plays femme fatale roles, here is cast against type in a rare wholesome lead and does quite well. Best of all in the human cast, however, is young Nico Parker (daughter of Thandie Newton). Her scientific curiosity gives what could have been a shallow role greater depth. As for the circus setting, Burton is a master at creating this sort of world, and, aided with some excellent period production design, both the Medici show and Dreamland come to life. Dumbo is the epitome of an unneeded remake. The title character is less flying elephant that fortuitous cash cow, and the movie loses all sense of proportion in its climax. Before that, however, Burton and Kruger tell a sweet story with the aid of a likable cast. The result is a movie whose highs and lows balance out to produce a mediocre final result. However, TV networks need filler, and this Dumbo will eventually find a home padding out the roster on some version of Disney’s new channels. It won’t, however, find a home for very long in the big top of the local multiplex. In this clip, the Farrier children first learn that Dumbo can fly.